Ahhhh winter weekends. Aren’t they great? Usually, life slows down a bit, as there are less sporting events, fewer get-togethers as the Holidays wind down and a little more time to just breathe. 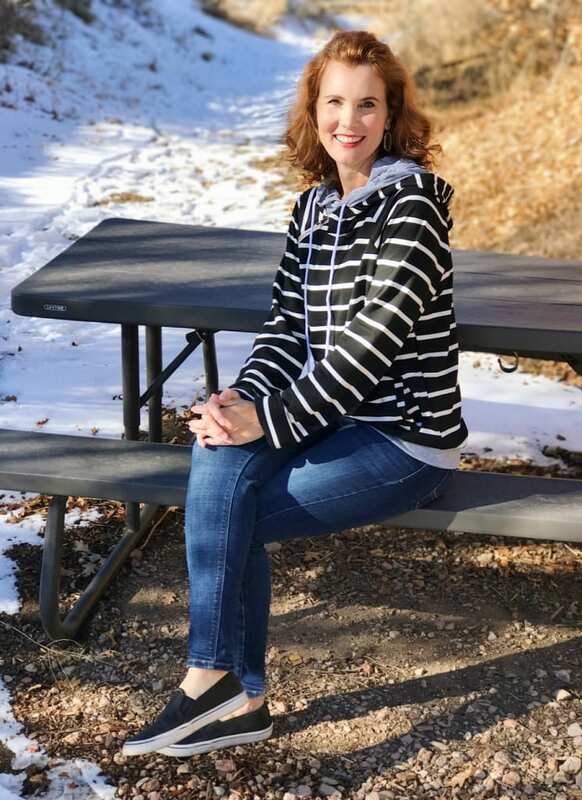 Winter weekends are for throwing on your favorite sweatshirt and jeans and calling it good. I saw this black and white striped sweatshirt on Pinterest and knew it needed to be mine. 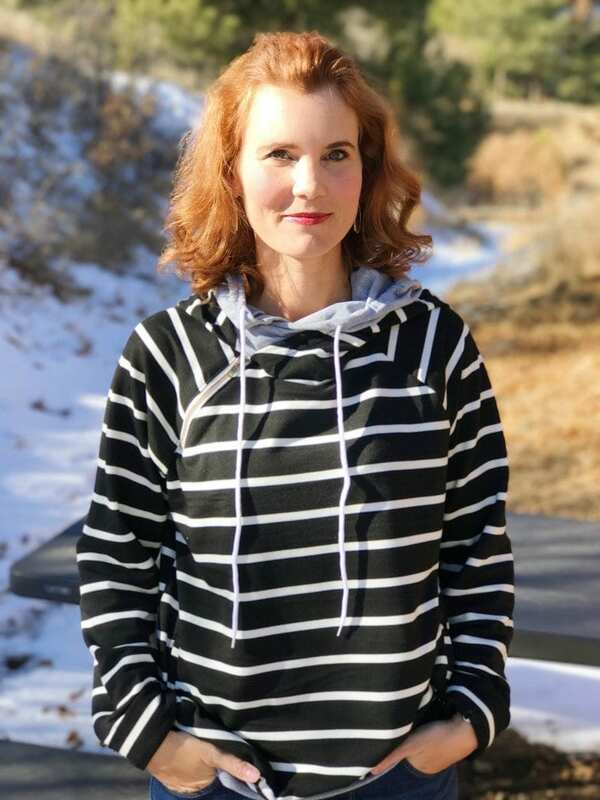 It’s the StyleDome Double Hooded Striped Sweatshirt featuring a funnel neck style and let me tell you, it is so extremely comfortable. It’s currently listed for under $25, which is a great price for a thick sweatshirt like this. Here are four casual weekend outfits that still look stylish. Here’s a replica of my outfit above. If the weather is too chilly for slip-on sneakers, you can easily switch them out for boots like these. I have the taller version of these boots in Chestnut and I wear them non-stop. Black and gray look so stylish together and like you got it going on. This would be a great outfit for out and about running errands. You can’t beat a t-shirt, cozy cardigan and soft fluffy boots for a day of relaxing. I have this cardigan in gray and my oh my is it ever comfortable. This is the perfect outfit for chilling out around the house. And if the need arises for you to leave the comfort of your warm home, just switch out the slippers from some black ankle boots and you’re good to go! The third outfit is my favorite! I love that sweater! 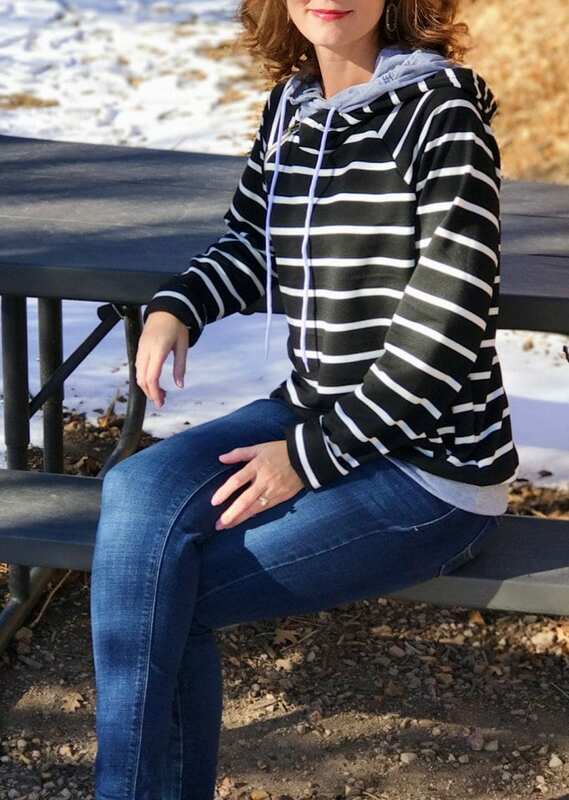 I love that striped sweatshirt but am wary of the Asian sizing. Can you give me an idea of your height/size for reference in ordering? How long was your shipping? The description on Amazon is saying mid January to early February. ? I’m 5’5″ about 127 and I ordered a medium. It fits perfectly. I’ve definitely noticed Asian sizing runs small. As far as shipping, it arrived to me in a week. I think the description says that because it’s a popular item right now. Hope that helps! I love the third outfit with the green cardigan. So cute and cozy! Thanks Christina! I have that cardigan in gray and love it. Very cozy!